Some home remedies for colds, particularly those that go back several generations, contain whiskey as a primary ingredient. The use of whiskey for relief of the common cold is popular, as it is believed to soothe a sore throat, improve cough symptoms, clear stuffy noses and promote sleep. Some evidence even backs up the benefits of these home remedies. However, seek a pediatrician’s advice before using these alcohol-containing remedies on children and infants. A hot toddy is one of the most popular whiskey-based home remedies. Versions of this spiked tea vary, but a common recipe is a mug of hot water, 1 shot of whiskey or other distilled liquor, 1 tablespoon honey and a slice of lemon. Another favorite is whiskey cough syrup, an old fashioned cold remedy that contains no drugs or chemicals. A simple recipe is 2 parts honey and 1 part whiskey, while another recipe calls for 2 parts whiskey and 1 part each vinegar, honey and brown sugar. The usual dose is 1 tablespoon. Another remedy is sucking and extracting the juice from whiskey-soaked lemon halves. 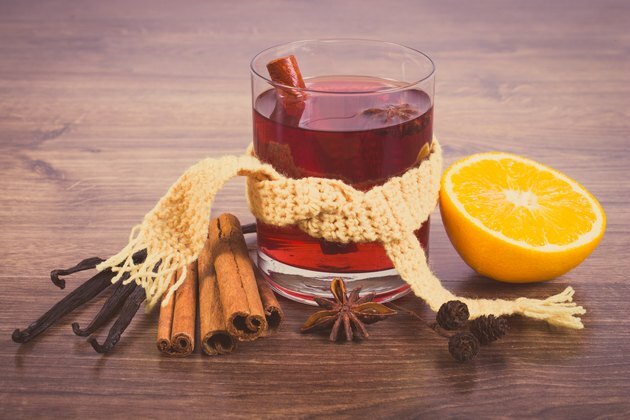 While some people may turn their stuffy noses up at these home remedies, there are several reasons why a hot toddy or even a nonalcoholic hot tea may help. A small study published in the December 2008 issue of “Rhinology” provided cold sufferers either a hot or room temperature fruit-flavored beverage, and compare the effects on symptoms. While both beverages improved runny nose, cough and sneezing, the hot beverage also improved sore throat, chills and tiredness -- supporting the notion that hot beverages and simply any fluids can improve cold symptoms. While whiskey, a distilled alcoholic beverage made from grain, is touted to help improve cold symptoms, there’s little evidence it actually works. Moderate -- but not excessive -- alcohol intake is linked to immune system benefits, according to an October 2007 article in “British Journal of Nutrition,” although there is not specific, quality research linking whiskey to improved cold symptoms. But there are potential reasons whiskey may help. The alcohol in whiskey is touted to soothe and numb a sore throat, clear nasal passages and make it easier to sleep at night. Whiskey also contains polyphenols -- plant chemicals with beneficial antioxidant properties. A study published in the October 2010 issue of “British Journal of Nutrition” linked a polyphenol-rich beverage -- although not whiskey -- to reduced symptoms of the common cold. However, there is no quality evidence that links alcohol or the polyphenols in whiskey to improved cold or cough symptoms. A common ingredient in common cold home remedies is honey -- a substance known to have immune benefits with properties that acts against both viruses and bacteria. According to a review published in the June 2014 issue of “Evidence-Based Child Health,” honey is better than placebo in improving cough symptoms, and as effective as an over-the-counter cough suppressant. Another study published in the September 2012 issue of “Pediatrics” found honey to be more effective than placebo in improving cough and sleep quality in children, although for safety reasons honey should not be used in children younger than 1 year of age. Many of these whiskey remedies also include lemon, a source of vitamin C. While this vitamin is linked to decreased cold severity, the amount of lemon found in these remedies is too small to be explained by the vitamin C content. In addition, the antibacterial and antiviral properties of vinegar -- found in one of the whiskey cough syrup remedies -- may also help fight the common cold. Whiskey-containing cough and cold remedies may offer symptom relief, but are not a cure for the common cold. Precisely how these help is not clear, but the individual components, or the combined effect of these ingredients may be responsible for the benefits. If you have a cough, sore throat, headache, congestion or fever that won’t go away, or if you have chest pain or trouble breathing, see your doctor. In addition, keep in mind that too much alcohol may not help your symptoms, as this may cause dehydration and dampen your immunity. Finally, if you are considering the use of whiskey in home remedies for children or infants, talk with your child’s pediatrician first. British Journal of Nutrition: Moderate Alcohol Consumption and The Immune System: A Review. British Journal of Nutrition: Immune-Modulating Efficacy of a Polyphenol-Rich Beverage on Symptoms Associated With the Common Cold: A Double-Blind, Randomised, Placebo-Controlled, Multi-Centric Clinical Study.